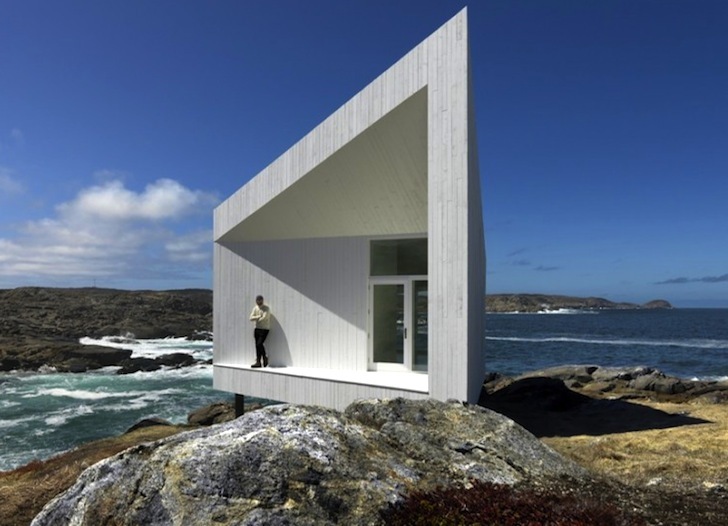 Squish Studio is the latest of Todd Saunders' mesmerizing minimalist art studios on Fogo Island in Newfoundland, Canada. 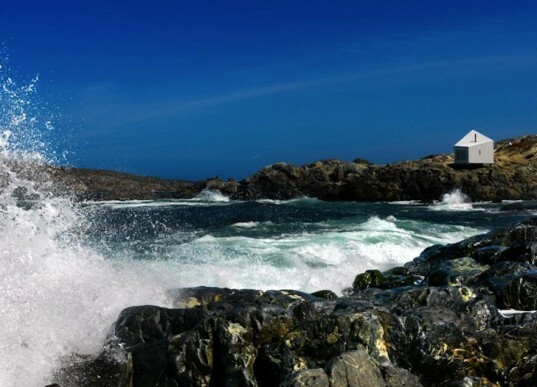 Commissioned by the Shorefast Foundation and the Fogo Island Arts Corporation as part of a grander plan to both preserve and rejuvenate the island's rich cultural heritage, each of the six cabins offers a fortunate artist a breathtaking space in which to harvest artistic inspiration. So named because of its "squished" appearance, this solar-powered studio just outside of Tilting features a compost toilet and wood-burning stove while its stark-white spruce cladding offers a bright contrast to the stormy Atlantic coastline. From a distance, the 130 square meter studio is swallowed up by rock, water and sky, but close up, several interventions have given the almost celestial space great expanse. The pitched southern entry rises 20 feet off the ground, which is double the height of the northern end of the studio, ensuring protection against fierce Atlantic winds. A full-length oblong window provides an uninterrupted view of Round Head. The solar panel from which the studio derives its energy was erected on a separate hill. Stored energy powers gentle nighttime illumination, which gives this remarkable structure even more ambience. A wood-burning stove provides heat, the interior is finished off with the same bright white spruce panels that clad the exterior, and a compost toilet further promotes the most negligible environmental footprint possible. If, like us, you simply can’t get enough of Saunders’ work, take a look at the recently profiled Tower Studio also built on Fogo Island.